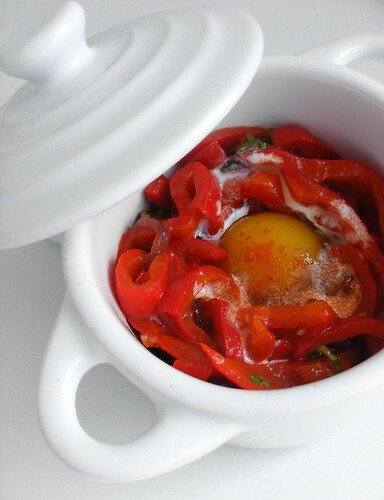 I don’t know why bell peppers (paprika’s in dutch) hardly ever seem to play the leading role in (my) recipes, but in this Spanish inspired recipe they do. It’s not the quickest recipe, but it is easy and you can do most of it well in advance and pop it in the oven just before serving. Normally I make 1 or 2 medium size ovendishes, but today I used tiny little pots and quail eggs instead of chicken eggs. So it wasn’t just delicious, it looked cute too. Wash the peppers. Cut off the head and slice lengthwise in half. If you have a stovetop smoker, smoke the peppers (skin sides up) for about 10-15 minutes. But don’t worry, without smoking them the result will be worthwhile too. Or maybe you could add some Spanish smoked paprika. Take peppers out and slice in 5mm thin slices. Slowly saute the onion and garlic in some oil for about 5 minutes until translucent. Add the sliced peppers and saute for another 5-10 minutes. Add the passata, season with salt & pepper (or chickenstock powder) and simmer for 5 minutes. Divide the mixture in 1 or 2 oven dishes. Push a hole/ditch in the middle and carefully break an egg in it. Add 1 or 2 teaspoons of cream and a dash of cayennepepper. Put in a 180°C oven for about 12-15 minutes. If the mixture was prepared before and cold I would heat it up (in the oven) before adding the egg. But that’s because I like my egg to be runny. Serve with bread or pasta. Different from what the name suggests, this is a very typical dutch sandwich spread. I know that in France and Belgium they mean something else with “filet américain”, something the rest of the world calls “steak tartare”, but I’m dutch and this is what dutch people call filet américain. When I was young this was a luxurious treat for special days, nowadays it’s a cheap, day-to-day spread from the supermarket. Their recipe “degraded” so much over the years I decided to start making my own. After all, it’s dead simple, anybody with a blender can do it. I like it with finely chopped raw onions on top and lots of freshly ground black pepper. 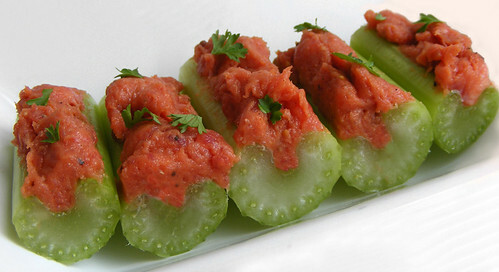 Spread on a sandwich or going back to the seventies and spread it on some celery sticks! 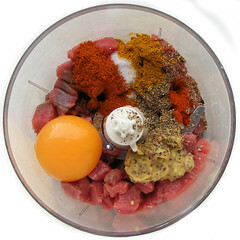 Dice the beef and add with all other ingredients to your blender. Blend for quite some time, it really has to become a smooth paste. Taste it and see if you need to add some more spices or salt. Eat the same day, I wouldn’t keep it for longer than 24 hours. Refrigerated of course. Any lean beef will do. You just don’t want any strings of fat in it because that won’t blend. It doesn’t need to be the most expensive cut, flank steak (bavette) will do just fine. I recommend Kewpie mayonnaise because it’s nice and sour. You can use raw egg yolks instead or a sweeter brand of mayonnaise, but then you might want to add some lemonjuice or vinegar. I use wholegrain mustard from Limburg and “Kerry Djawa” currypowder. Another classic from Sichuan. There’s no fish or fragrance of fish in there, it’s just a reference to the sauce that originally was used in a famous fish recipe. Like most classics there are hundreds of variations on the dish, with or without meat. I use Ken Hom’s recipe but I skip the deep-frying part, which makes it a easier, quicker and lighter. Maybe not as buttery and velvety, but still very delicious. We eat this regularly. Simply serve with white rice. 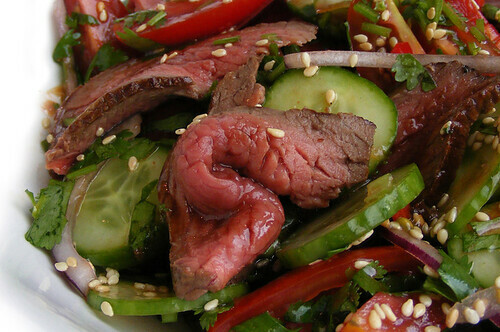 Tomato, cucumber, red onion and beef sounds a bit boring for a salad. That’s probably why we only eat this salad about once a year. But every time we do I’m pleasantly surprised, thinking: “We should eat this more often!”. And what better way to remember than blogging about it? Carefully mix the salad ingredients together, then add the well-mixed dressing. That’s it. From: Crisp (Crispy) by Marie Claire. Another “classic” in our home. Quick, easy but still very, very tasty. 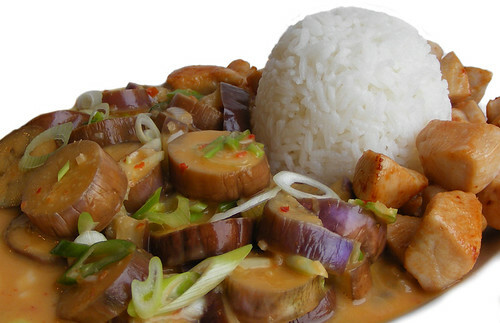 I really recommend the thinner, lighther purple Asian eggplant, but regular eggplant works too. You could pan fry the slices of eggplant before you add them to the sauce, but I don’t see the need in that. Heat a tablespoon of oil in a hot shallow saucepan with lid (hapjespan) and stir-fry the garlic, ginger, vinegar for about a minute or so. Add the coconut-milk, chili sauce, fish sauce and sugar and bring to the boil. 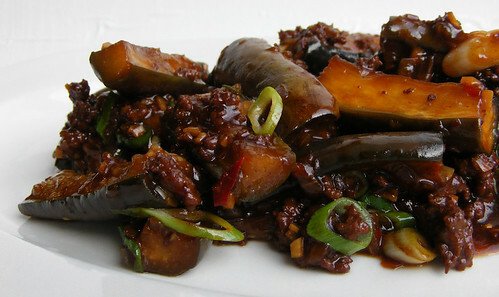 Add slices of aubergine, add lid and simmer for about 8 minutes or until the eggplant is soft. I like to thicken the sauce a little with a teaspoon or two of cornstarch mixed with some cold water. Taste and add fish sauce, sugar or lime juice if needed. Sprinkle with spring onion and serve. Serve with white rice and simply stir-fried chicken to which you add a little Shaoxing rice-wine in the end. Fish or shrimp could work too. Slices of duck breast didn’t work, in my opinion. From: A Passion for Vegetables (Wereldse Groenten) by Paul Gayler. 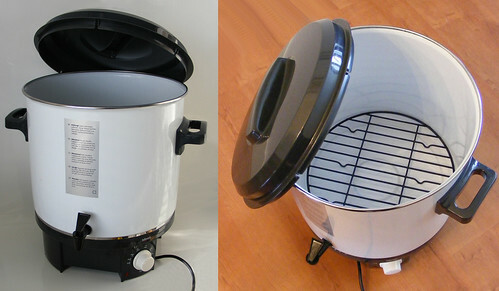 If you don’t want to spent thousands of euro on a professional waterbath (Roner) or even a hundred or two on a temperature controller (SousVideMagic) for your ricecooker or crockpot, then this might be something for you too: an electrical canner. The one on the photo is used to be regularly on sale at Lidl for just 30 to 40 euro. Okay, it’s not to the 0.1°C precise like a real Roner, but the 3°C or 4°C fluctuation up and down is good enough for me. You don’t have to keep an eye on it and it’s save to leave the house or go to sleep. The only real drawback might be the size, it’s rather big for an average kitchen. Peel the asparagus and trim 2 cm or more of the ends. Line the asparagus in a single layer in a bag. Heads up, towards the opening. Add butter, salt and sugar. Seal the bag and cook for 30 minutes at 85°C. They might seem too crunchy at first sight, but they’re just perfectly soft and tender. Simply serve with boiled egg, ham and the butter it’s cooked in. Or better, make a hollandaise sauce! PS Thomas Keller uses a splash of milk instead of the butter, but my vacuum sealer can’t handle liquids. I’ll try freezing some milk next time, but I guess when you serve your asparagus with a buttery sauce anyway, it won’t make much difference, butter might even be better. 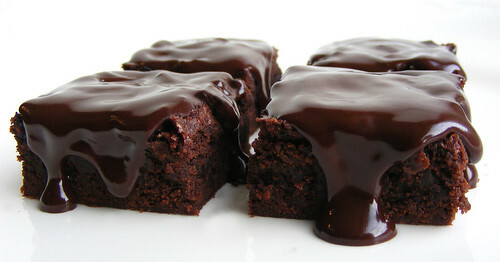 Although I only baked it twice, this mudcake a.k.a brownie recipe is already proven a big hit. Maybe it’s the whiskey that makes even men drool? Preheat the oven to 160ºC. Grease a 20cm square tin and line the base and sides with baking paper. Dissolve the instant coffee powder in a few heated/hot tablespoons of the 250 ml whiskey and put with the butter, chocolate, sugar and whisky in a saucepan that you can hang in another pan with boiling water to heat au bain marie. Just be patient for everything to melt. It will melt by itself and it will become a beautifully consistent, thick sauce. Sieve the plain flour, self-raising flour and cocoa into a large bowl. Pour the butter mixture onto the flour mixture and whisk until just combined. Whisk in the eggs. Pour into the prepared tin. Bake for about 1 hour 15 minutes, or until a skewer comes out clean when inserted in the centre of the cake. It all depends a bit on size of the tin you use, I guess. I’m not an experienced baker, so just keep an eye on it. When ready, pour the extra whiskey over the hot cake. (I pinched it all over with a toothpick before pouring the whiskey) Leave in the tin for 20 minutes, then transfer onto a wire rack placed over a baking tray to cool completely. For the chocolate glaze, put the cream and the chocolate in the small saucepan and heat over another pan with boiling water au-bain-marie. Again, just be patient it will melt by itself. Stir until a nice, consistent chocolate sauce. Then set aside to cool and thicken a little. Spread the glaze over the cake, allowing it to drizzle over the sides. Leave to set. 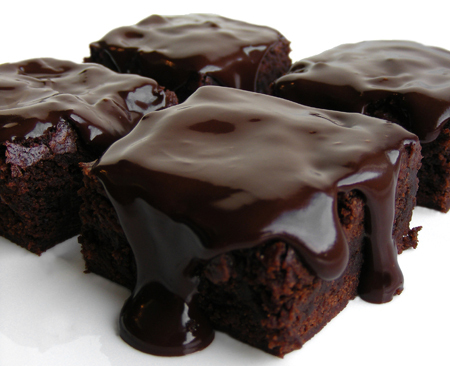 Or do what I did, I sliced the cake it cubes/brownies and dipped those into the glaze. Tip 1: you can freeze the (unglazed) cubes individually and just take out one or two for coffee.